I want to share with you something really cool I learned in the Learn 3D Modeling-The Complete Blender Creator Course over at Udemy.com. It's really a cool course, although it is time consuming and labor intensive. LOL...yes, you must be willing to follow along and do the exercises with the videos. It's a good way to learn! One of my weaknesses with Blender is dealing with textures. I just can't seem to wrap my head around it and make it work right...LOL...and it is not for a lack of trying. I know this weakness so have avoided texturing at all costs with Blender Render and have definitely stayed way from Cycles Render, which was introduced I believe in Blender 2.61 in 2011, and appears to be a complex nightmare. But, Michael, the video lecturer, makes it easy to learn about Cycles Render taking it in small bits and applying what you have learned to projects we create. Cycles Render is not as scary as I once thought. 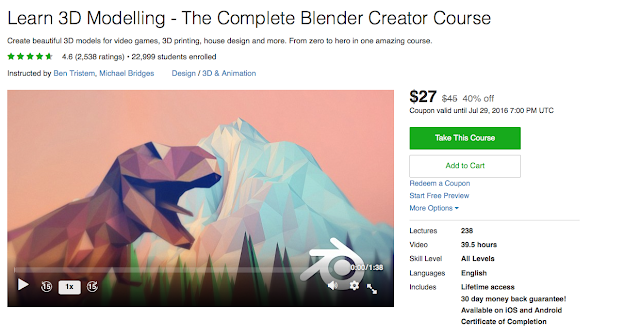 In my last post, July 24, 2016, I was very excited about an online course I started taking over at Udemy.com...Learn 3D Modeling-The Complete Blender Creator Course. This is such a great course for beginners that takes you from nothing nothing to advances. As you can see, I posted the course info and the price, which I purchased the course at, so you could see the reasonable pricing. I certainly hope many of you took the opportunity to enroll in this course if you are seeking to learn Blender. Because I was in for a HUGE SHOCK today when I went to the site to copy and post a new screen shot with the pricing back at the original $45.00 USD. I didn't think it fair to my readers to to continue posting an out-of-date pricing image. Wow...just...Wow! I am in a state of shock! I WAS going to do on Blender's Cycle Render nodes but after I seen the updated pricing I thought I should let you know the major jump some of the prices, not all, have taken at Udemy. com today.